Betty J. Baughman, 92, of Tiffin, formerly of Findlay, passed Tuesday, April 10, 2018, from this life onto her eternal life, at The Heritage Estates, Findlay. She was born June 3, 1925, in Findlay, the youngest of 12 children, to Charles and Margaretha (Gerber) Dietsch. She married Melvin D. Baughman Aug. 10, 1946, in Findlay, and he preceded her in death March 22, 1996. She is survived by twin sons, Michael R. (Glenna) Baughman of Dayton and Melvin J. Baughman of Hayward, Wisconsin; a foster daughter, Wendy (Gary) Johnson of Tiffin; two granddaughters, Danielle Baughman of Dayton and Sarah Carpenter of Tiffin; two grandsons, Eric (Jessica) Johnson of Findlay and Michael (Stephanie) Johnson of Tiffin; six great-grandchildren, Mallory and Aiden Carpenter of Tiffin, Kaitlyn and Mason Johnson of Findlay and Meredith and Madalyn Johnson of Tiffin; a stepgranddaughter, Jemella Hammons; a stepgrandson, Kyle Goetschel; and two stepgreat-grandchildren, Wyatt and Charlotte. She was preceded in death by both parents; her husband; seven brothers, Edward, Charles, Ernest, Chris, Ralph, Roy “Snitz” and Don “Johnny;” four sisters, Anna Dietsch, Hilda “Gilly” Bennet, Claire Ohse and Evelyn “Evie” Jensen; and a daughter-in-law, Sue (Spalding) Baughman. Betty was a 1943 graduate of Findlay High School. 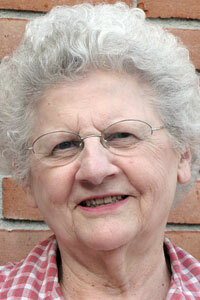 She worked at her family candy shop, Dietsch Brothers, Findlay, until her marriage. Betty and Melvin were members of Trinity United Church of Christ, Tiffin, for more than 60 years, where she taught Sunday school, and she was a member of Mothers Circle, Keenagers and Trinity Women Together at Trinity United Church of Christ. Betty was famous for organizing and spearheading many events at church, including packaging Christmas boxes, preparing funeral luncheons and working fundraisers. She volunteered at the former Betty Jane Center for many years as well as many other local organizations. Faith and family were the cornerstones of her life. She devoted years of caring to her siblings in their later years and tirelessly gave of her time to others. Friends may visit with the family 10-11 a.m. Monday, April 23, 2018, at Trinity United Church of Christ until the time of the service at the church. Her memorial service will begin at 11 a.m. Monday, April 23, 2018, at the church, with the Rev. Kurt Blaufuss officiating. A luncheon will follow at the church. Burial will be private in Maple Grove Cemetery, Findlay. Memorial contributions may be made to Trinity United Church of Christ, Alzheimer’s Association or a charity of the donor’s choice.